VANCOUVER — Members of the Board of County Councilors voted Tuesday to approve a staff proposal and ordinance that will amend the county’s Comprehensive Plan to allow for freight rail dependent uses in areas adjacent to the Chelatchie Prairie Railroad in Brush Prairie. 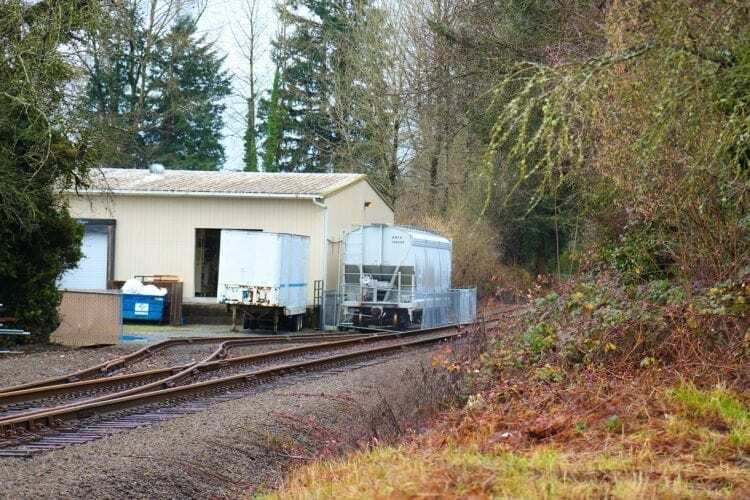 The freight rail dependent uses changes came about after a bill was passed by the state legislature last summer that allows for those uses in areas zoned rural and resource lands, according to Jose Alvarez, a planner for the county’s Community Planning organization. The proposed changes appeared before the county council for public hearing as a result of recommendations made by the Planning Commission during a meeting on Nov. 16, where the commission unanimously voted to recommend that the council approve a freight rail dependent use overlay map and policy language that would include rail use to be added to land use for rural resource lands in the comprehensive plan. Quiring noted that under the legislation, such uses are considered both urban and rural development for zoning purposes. The overlay map that the council adopted outlines areas in the county that can be considered for freight rail dependent uses. The properties are all within 500 feet of the line and lie between NE 119th Street and NE 149th Street. Alvarez said that the state statute did not provide any locating guidelines except that the properties must be adjacent to the railroad, so county staff settled on a baseline of including any properties within 500 feet of the line. 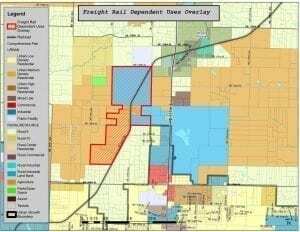 Alvarez also said that upon adoption of the Phase I proposals by the county council, Phase II would involve creating development regulations for the lands covered by the overlay map and creating a list of uses allowed in the freight rail dependent uses area. This photo shows the map overlay for the affected areas. Click to open PDF. During public testimony for the hearing, citizens came out both in favor of the changes and against them. Attorney Mark Erikson represented homeowners in the affected areas and said that “we think you’ve got the cart before the horse.” Erikson raised concerns that the county had not created changes that were consistent with the state’s Growth Management Act. He also said that location criteria had not been adopted as yet, and those criteria were required before any map changes could be adopted. Erikson also raised concerns that the current railroad infrastructure would not be able to support increased rail traffic, as well as fears that the parcel sizes allocated under the overlay map did not allow adequate stopping distances for trains, and thereby created safety hazards. He concluded by saying that 18 of the properties selected in the overlay map showed residential use, and therefore did not require the state’s statutory requirements of the lands being agriculture, forest or resource lands. David Shook, a resident of Brush Prairie, expressed similar concerns. “Our concern becomes developing areas near residential areas that impact the quality of life for everybody living in the area,” said Shook, who did not believe railroad development should be allowed near residential areas. She proposed that the county adopt additional policies that would provide for buffering to protect those rural interests. Others came out in support of the proposed changes. Local attorneys Steve Horenstein and Jamie Howsley expressed support for the overlay and changes. Horenstein called the changes a “reasonable solution to move forward.” He noted that the adoption of the changes was only the first step and that developer regulations were still needed going forward. Howsley noted that the Comprehensive Plan can only be amended once a year, and the amendment process must be done first before the county can move forward with creating developer regulations. Daniel Weaver, chair of the Railroad Advisory Board, said that “we have the opportunity to add some land that has been in demand” for several years to help eventually produce more jobs inside Clark County. Mike Bomar, president of the Columbia River Economic Development Council, came out in support of the proposed changes, and noted that 92 percent of residents in Battle Ground had to leave town to work in Vancouver or Portland. Adding freight rail dependent uses in Brush Prairie would help create jobs more locally in an area that has many people commuting to work. Rasmussen shared Bomar’s views that the freight rail dependent uses changes would help create jobs in rural areas and help alleviate the employment disparity between urban and rural areas. Council Member Julie Olson noted that the council had two options to adopting changes. One was the recommendation directly from the planning commission, and the second amended policy had language taken directly from the state bill that defines freight rail dependent uses. The second option was ratified by the council. Council Member Jeanne Stewart said that she supported the second option which had the state’s definition included. She said that economic development “is sort of a two edged-sword,” in that it needs to happen, but when development standards are created, they must mitigate impacts on the nearby area. According to Council Member John Blom, who supported the changes, future development regulations must be approached carefully. He also stated that the changes adopted at Tuesday’s meeting do not allow for new development, but rather serve as a first step to analyzing development possibilities along the railroad in the future. Council Chair Marc Boldt, who also supported the changes, acknowledged the concerns of Brush Prairie residents regarding quality of life. The council unanimously approved the staff recommendations regarding adoption of freight rail dependent uses. The members then voted unanimously to adopt an ordinance that amended the comprehensive plan, and included language that codified the changes to freight rail dependent uses.